With years of experience in planing celebrations we host your private party or company festivities. Our winter garden offers a classy and cozy ambiance. Let us pamper you with our home-made cakes, cold and warm buffets or individually prepared menus. 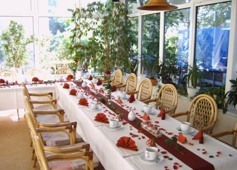 We create and arrange table decorations, flower arrangements and we also organize the musical surrounding.